The key to SkUp as a construction modeler is to think out of the box. Unlike a more complicated BIM or solid modeling program, the free version of Google SketchUp is a simple and easy to use surface modeler. That means it’s very quick to make, modify, and assemble the pieces of a building or other structure. 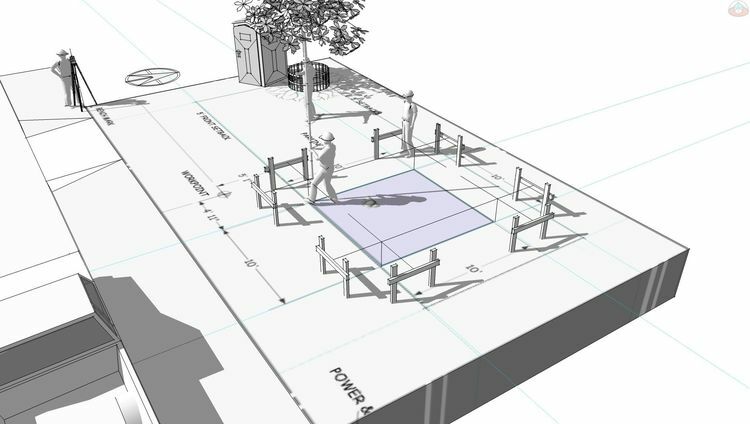 Important though is that it’s this piece-based assembly, rather than a single-shaped static-design model, that makes SketchUp a construction communications tool. Almost all of the pieces used in construction are variations on a box. This includes milled and engineered structural members, as well as formwork, foundations, framing and most of the parts found in the building’s mechanical systems. 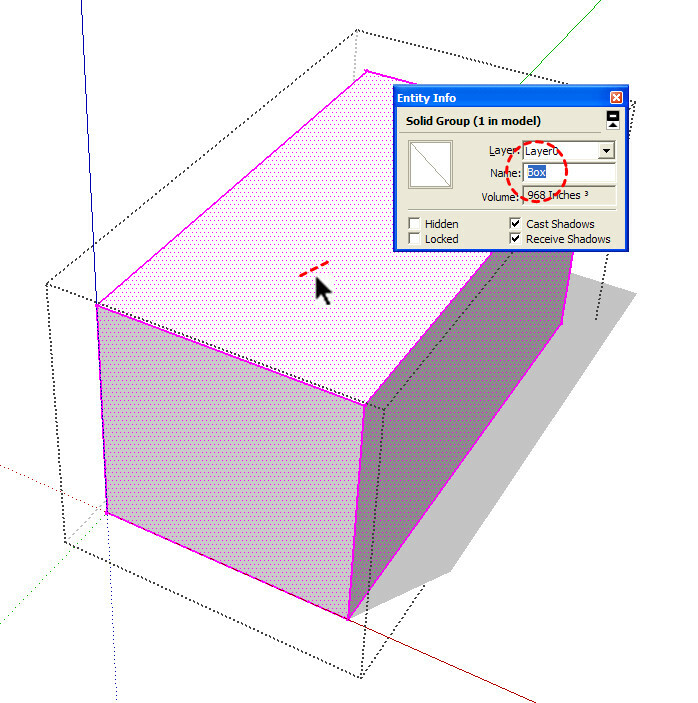 In SketchUp a box starts with a 2D profile. The 2D profile is then extruded into 3D with the Push-Pull tool. For some objects the profile is shaped or modified with drawing tools before the extrusion. To convert the 3D surfaces and edges of the extrusion into a piece that’s ready for assembly, you need to immediately group and name the box as a distinct object – even before finalizing its shape. To group the extrusion as a single object, triple click any of its surfaces, and select Group from SketchUp’s Edit menu. When you use shortcut keys, the fabricating process is really fast: 1) Triple click; 2) Key-in “g”; and 3) Name the group in the Entity Info box. (See this video for setting up ShortCuts ). Groups are quick to make and easily modified with the Edit Group command (or double click). They also save a lot of time when there are only a few instances of the group in the model. For example, use groups for a model base, concrete footing, or part of a building system (See this video to review groups). 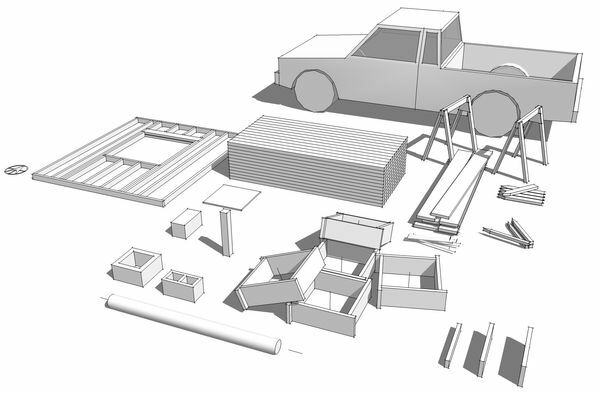 In SketchUp, you can also make any piece of an assembly a component, but avoid components unless you know you’re going to be using a lot of pieces throughout a large construction model – for example as an array of studs, joists, or the steel in a moment frame. Components reduce calculation time as you move in and around large assemblies with hundreds of similar pieces. They are also important when an object is going to be saved into a stock library folder. To make and save a component, right click a group and select Make Component, then right click again and select Save As to store it in a file on your computer. Even a simple construction model uses a lot of the same standard pieces. That means once a piece is manufactured you can save it so it’s ready for assembly in a new model. In other words, you can add to your collection with every model you build. You can also Save As any piece as a component from any another construction model — hundreds are available to save from the models found in our books alone. Groups can be easily edited in SketchUp, but changes get complicated when you start modifying components. To make things quick and simple, resize components with the Scale tool instead of editing each as a unique piece. For example, framing members can be resized to fit different lengths along a single axis without affecting other copies. This saves both the time it takes to make a unique component and the confusion that comes with having several minor variations of the same component. 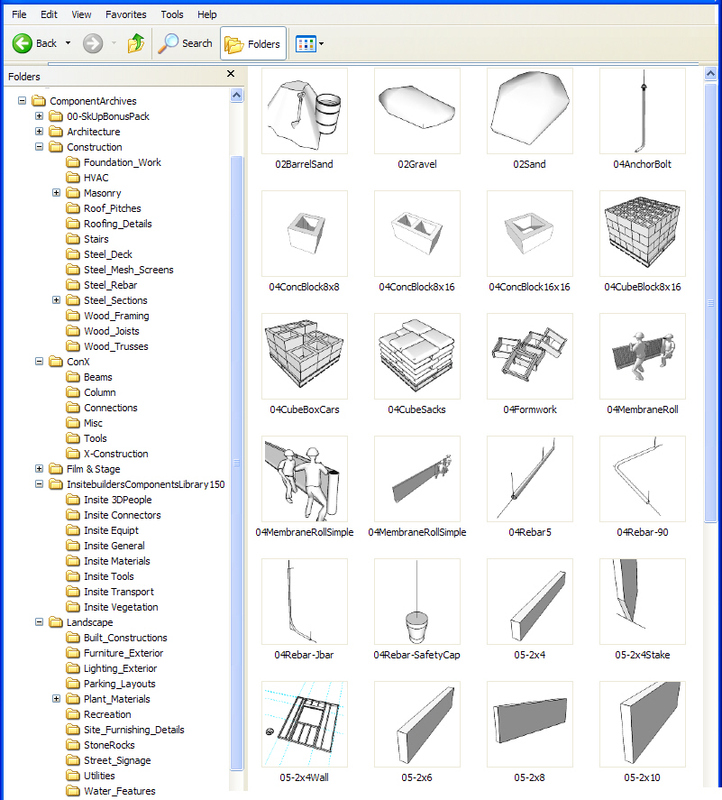 Even a few unique components are cumbersome and have little value in construction modeling. If you need to change a component and only want a few copies of the new version, its much faster to Explode the component and immediate Group and rename it as you build a model. Using shortcut keys again: 1) Select the component; 2) Key-in “e” to explode; 3) Key-in “g” to group; and 4) Rename the new group in the Entity Info box. Of course, construction modeling only works for builders who know how a building actually goes together in the real world – piece by piece. And just like the real-world, when assembly is smooth and everything is coming together quickly, it’s tough to slow down and keep the jobsite and materials organized. At the same time, the importance of a well organized construction model is exactly like a well organized construction project. 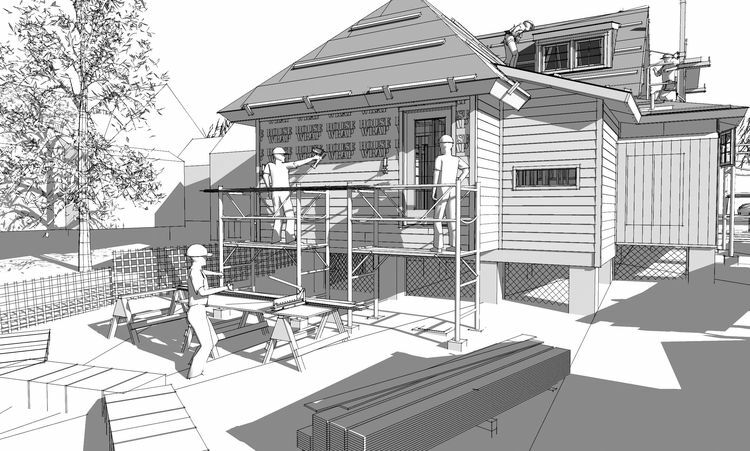 As such the SketchUp Outliner acts as both a management tool and a materials list. 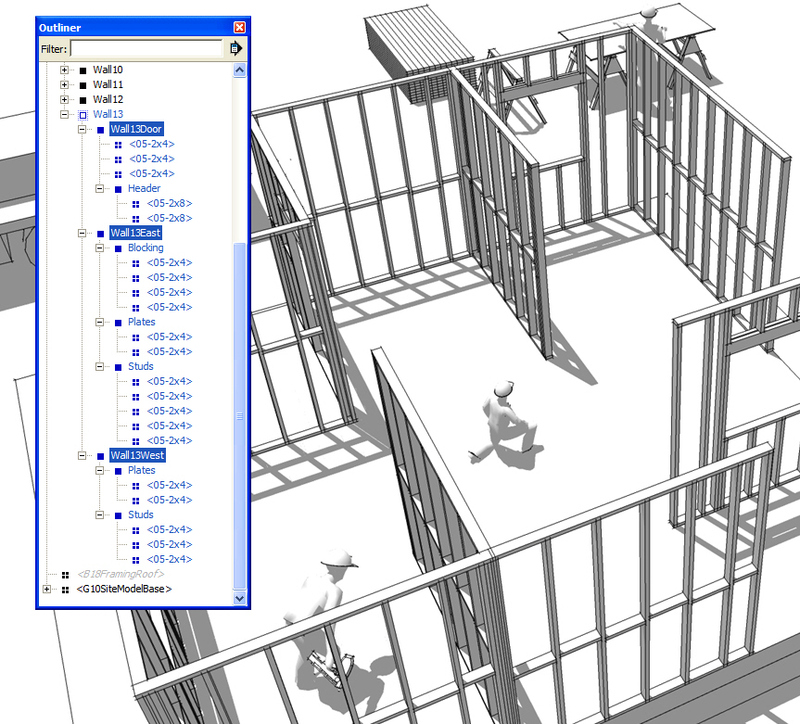 When the pieces are grouped and named in categories (concrete block, rebar, joists, blocking, and subflooring), they can then be nested into assemblies (stem wall, floor, wall, roof framing, building systems), and these assemblies can then be grouped according to phases or sequences or further subdivided into subcontracts. This means the pieces in the Outliner can be controlled, counted and correlated to a spreadsheet or schedule. 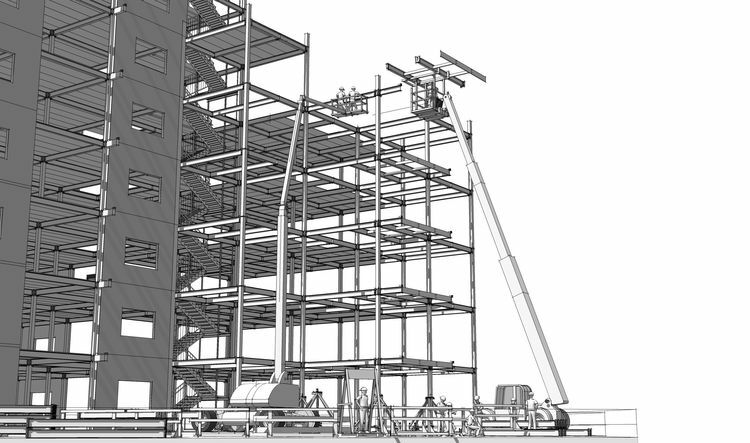 In other words, the construction model can be used to generate materials lists, illustrate parts of the assembly, or animate sequences as slides or videos to communicate the construction process. Most important, no piece or assembly is ever lost. The model can be deconstructed, resized, and modified for every new project that comes along. The result is a very effective management and marketing tool. One that clearly demonstrates what your company can and will do in an increasingly competitive construction industry.